After many years of organising and being involved in community activities, Dawn Clarke, manager of the Local Area Partnership (LAP) for Cheshire East Council suggested I develop a Coomunity Group. Mark Sheeky designed the artwork for advertising and we now have a huge banner to use when we are promoting our various events. This will become our branding. I wanted also, to diversify in the shop and become an outlet for local artists and craftworkers to display and sell their products because we don’t have another venue like this in Crewe. The response to the advert in the Chronicle has been brilliant and I am amazed by the talent I am seeing. Our first community event is our annual Poetry Blast. Jim Bennett & Angela Topping have both agreed to return. This year as we commemorate the centenary of WW1 we will include works by some of the well known poets from this era. Our raffle prizes were very kindly donated by Councillor Peggy Martin, our previous Mayor and now our Deputy Mayor for Crewe Town Council. Woodware kindly donated a craft prize which was won by Mrs Carol Burrows. Papers used are Bo Bunny "Winter Joy" and Core Co-ordinations, both papers embossed. I cut an aperture in the Bo Bunny paper (using old box lid as a template). 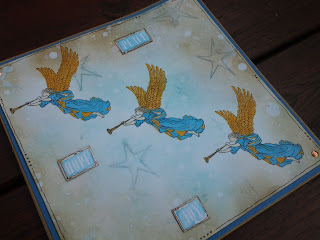 The Angel was stamped with Memento ink and coloured in with my pro markers then double embossed and placed in the aperture. 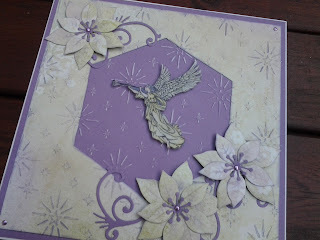 Using Marianne poinsetta dies and the Bo Bunny paper for the flowers, and the purple paper for centres. Papers used are Basic Grey in Glisten/Avalanche and Kaiser card in a pale turquise. Also used woodware "Star" border for fancy edges. Star shapes were cut and embossed. Angel was again stamped with memento ink, coloured with pro markers, cut out and attatched to star shape for main image. 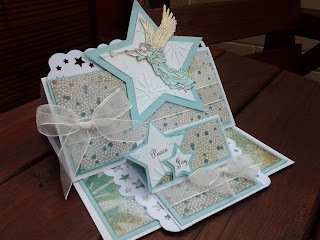 Two smaller stars were used for sentiments and attached to smaller card. White ribbon finished this off. Angel (s) stamped in memento ink and coloured with pro markers (what else), I then sponged paper with DI inks in tumbled glass, weathered wood and frayed burlap and then sprinkled with water to look like snow. Star shape was stamped in w.wood. I doodled a fine line round edge to give a bit of definition. This was then mounted on blue bazzill card and then kraft card base. Well it was hot, hot, hot but we had a fantastic opening night for "Masquerade". At the begininig of the week I was worried that we would not have enough work, but pieces drifted in and resulted in an amazing display. Costumes and masks were also fab so WELL DONE everyone who took part. Please send pictures to Mark or Suzanne for Facebook or the Blog. A big "thank you" also to Mark, Suzanne and Nigel for their hard work displaying all the work! Two lovely cards from Anne B using CHLOE stamp - Fuchsia Corner. We now stock a small range of Fresco Finish Paint from "PaperArtsy". It gives a wonderful chalky effect. 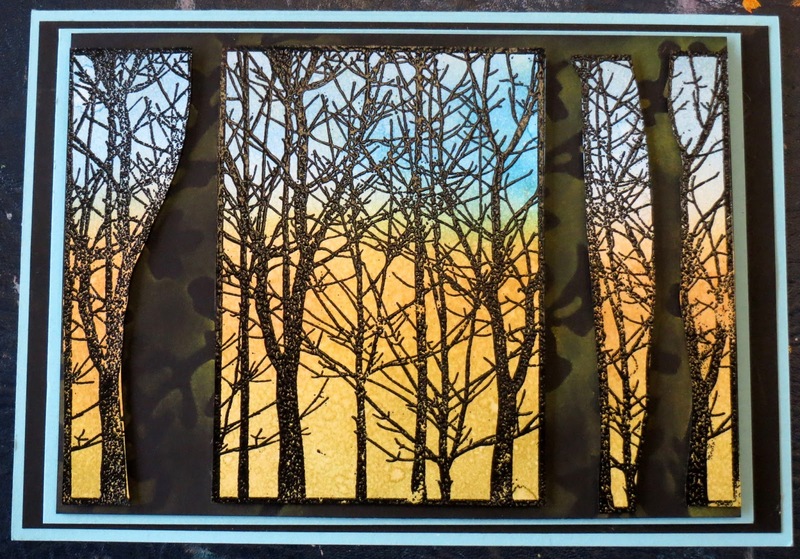 My panel from a recent workshop is shown below. I used Harlequin and Bingo Masks which were spread with Grunge Paste also from PaperArtsy to create the texture. The central element - stamp from Lin Brown's Eclectica range. I would like to show the two cards I made with IndigoBlu stamps for The Cubby Hole where these stamps are available to buy. 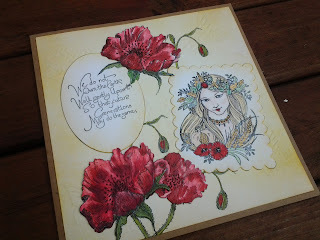 IndigoBlu: Blazing Poppies, Marianne Design Old- fashioned Christmas paper pad, Pink Paislee: various stamps from the Spring Jubilee set, Derwent Inktense water colour pencils and A5 Black card stock. I'd like to say a huge thank you to all those who came to Mark's opening night on 14 June. As usual he gave 110% with all his special effets - music, lighting etc. Great to see so many demons and I thought Mark was brilliant tottering about on his heels and flicking his hair back. If you missed it, you definitely missed out. After that - this Friday it is our very own expo - "MASQUERADE". As usual Little Sue has designed the poster. Mark and I are organising a Quiz Night. Date - Friday 2nd August. There will be prizes, food and entertainment. Cost to be confirmed. Friday 27 September is the World's biggest coffee morning for MacMillan Cancer Relief. A slight change to our usual schedule. We will be serving tea/coffee and cake in the HUB - community space in the indoor market in Crewe town centre on the Friday morning before moving back to the shop for the afternoon session. Shop again all day Saturday 28th with MAKE n TAKE as usual and hopefully a raffle. Our ARTISAN MARKET will be Saturday 6th October so start thinking about stalls if you want to participate. This year will be one day only and we will have more promotion and advertising. 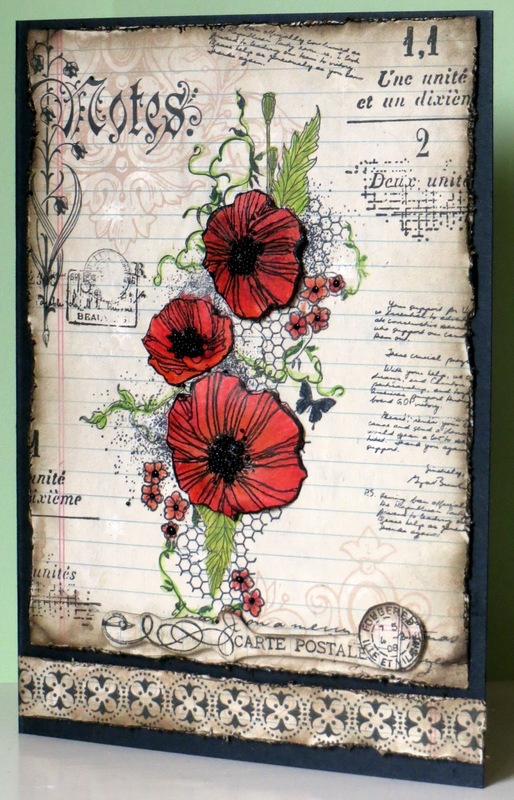 We now have a delivery from PaperArtsy. Wonderfully simplistic but very effective JOFY stamps designed by Jo Firth-Young. I have also started to stock a few of the fabulous Fresco Finish chalk acrylics - very nice! I will obviously add to the colour range! 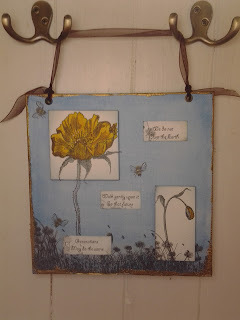 Painted background with blue acrylic, bottom edged with poppy border stamped onto tissue and adhered with PVA. Two poppy panels were added along with three word panels, a tiny bee stamp (Lavinia Stamps) to fill in a few gaps in the background. The panel was edged in Aged Gold embossing powder and eyelets made to thread ribbon through to hang the panel. The background was coloured with distress ink, Wild Honey and enbossed with butterflies. 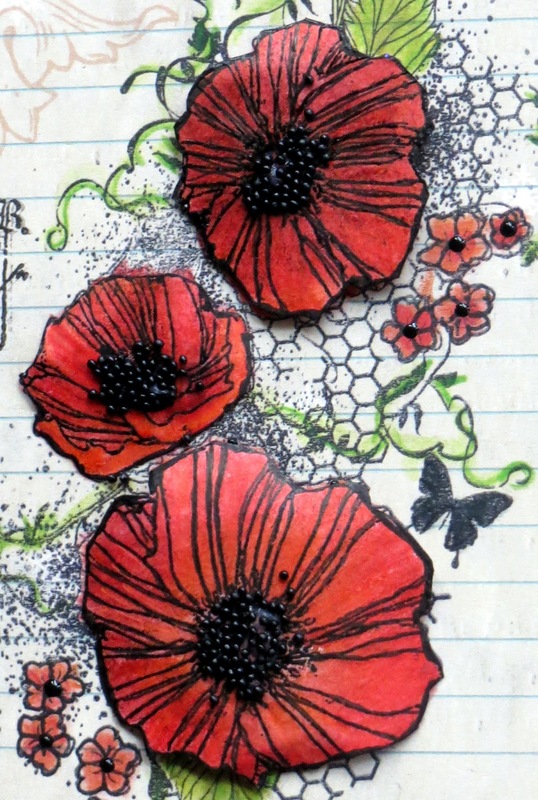 Poppies and images all stamped with Memento Ink and coloured with Pro-marker, a little distress stickles in Fired Brick added for effect. An additional layer of poppy heads was used for dimension. Word and image panels edged with Wild Honey. The girl image is an old stamp - Creative Expressions. I stamped two of the large poppies using masking technique and added smaller poppy coloured with my favourite Pro-markers. Glossy accents was used to enhance the stamens and the background colour brushed in with Adirondacks Stonewash Colour. Using Woodware Punch system a border was made for the bottom and red ribbon threaded through. The black butterfly was added for dimension. 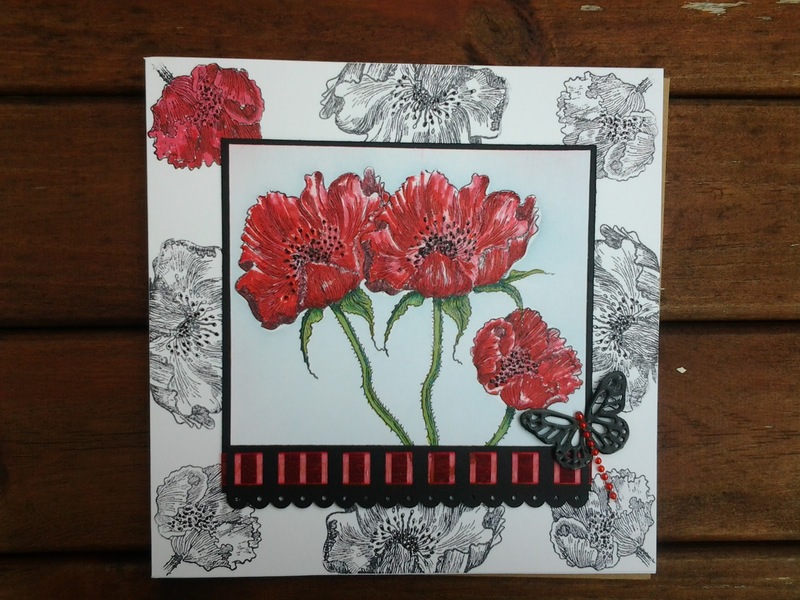 The card background was the poppy heads stamped in black and only one coloured red for effect.